A relative of the Matuzeski family, Brad Foster fought for his life against Metastatic Melanoma for over 3.5 years. 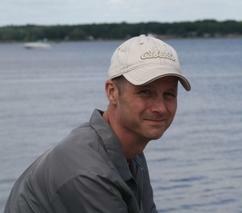 When there were no other options in West Michigan, Brad sought treatment at the Mayo Clinic. After those treatments failed, he was referred to an oncologist at Aurora Health/St. Luke's in Milwaukee conducting some clinical trials for Melanoma. St. Luke's, a phenomenal hospital, happened to be about 5 miles from where the Lake Express docks. The Lake Express cut down travel time and gave the gift of having valuable time with his wife and two young sons, safety, and the convenience and comfort of facilities while dealing with the horrible side effects from his cancer treatments. Every time Brad and his wife would return home from a treatment, their children and family would gather at the Muskegon Channel to welcome them home...good memories during a terrible time. During the treatment, the MMG (Muskegon Motorcycle Gang) held a fundraiser to offset the cost of the ferry. Brad passed away in December 2011, but it is too soon to say he "lost the fight to cancer," as he willingly subjected himself to so many research studies...he may still win that fight.